Falafels. These little perfectly flavored middle eastern appetizers are not only the perfect accompaniment to your next meal, but can actually BE the meal. At least in my book that’s perfectly acceptable. 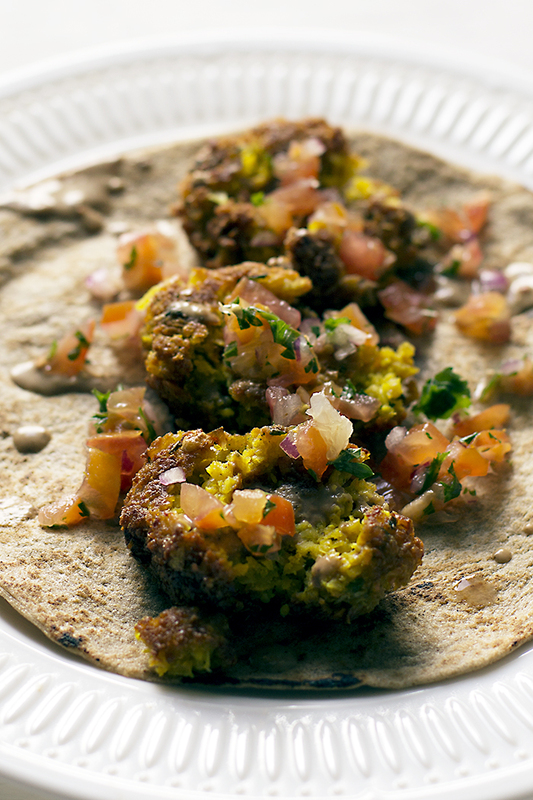 Falafels originate from every country in the middle east. And of course, there are so many variations of them. Some recipes say that they should only include fava beans, while others swear by the ever versatile chickpea. 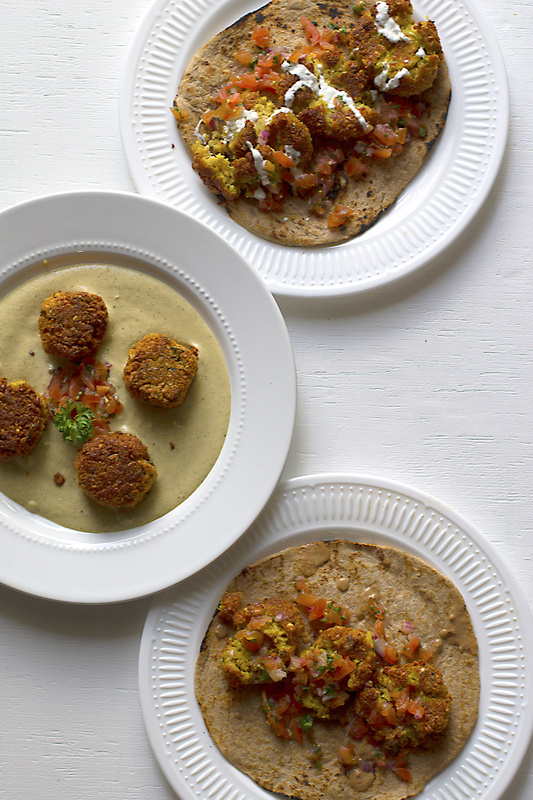 But I think we can all agree: what truly makes a falafel recipe is the golden, crispy exterior that perfect contrasts the fluffy and flavorful interior. And that can prove to be difficult. You just have to remember one thing: it’s all about the chickpea. What do I mean by that? Well, for starters, you have to use dry garbanzo beans. There’s no getting around it. Wait, so let’s take a step back for a sec. You may have heard of people referring to this versatile bean as either chickpea or garbanzo bean. Let’s just set the record straight – it can be either or. So, feel free to use them interchangeably. Back to the lesson at hand. Why is it important to start with dry garbanzo beans? Well, the canned variety have too much moisture to stick together when forming the falafels. 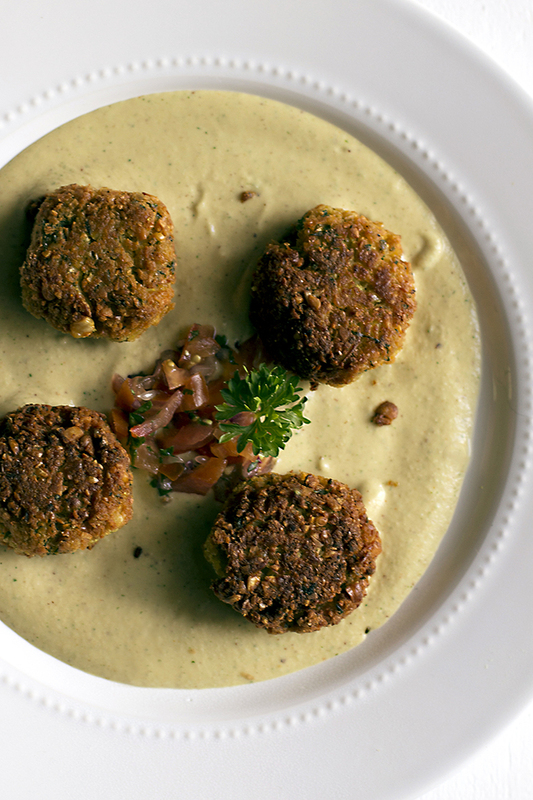 With dry beans, after soaking them overnight, they make the perfect falafel. Here’s the thing though. This whole process takes a lot of passive time. It’s all worth it though. I promise. Now, what did I do with these three recipes? I’m always interested in combining all my favorite flavors and I did just that. For one of them, I focused on the traditional flavors. But the other two? Well, I decided on a fusion of sorts. You see, two of my favorite cuisines, if you can’t tell by my other recipes, are Mexican and Thai. They’re my favorite because the flavors just explode in your mouth and leave you wanting more. I mean, what more could you ask for? I’ll tell you what you can ask for. More flavor. More fusion. Just more. So what I did here, after years of eating falafels and hours of investigating on how to cook the perfect one, was create a Thai-inspired recipe and one with a Mexican-flair. With different suggestions for dipping sauces as well (see recipe notes). This goes out to all my falafel loving people. They will not let you down. Finding the perfect way to make falafels is difficult. It’s a process and can be overwhelming. Thank God for blogs like Toria Vey. She’s put so much time and effort into creating her very own traditional falafel recipe, which is where I got my inspiration from. Big fan of falafels? Yea, me too. 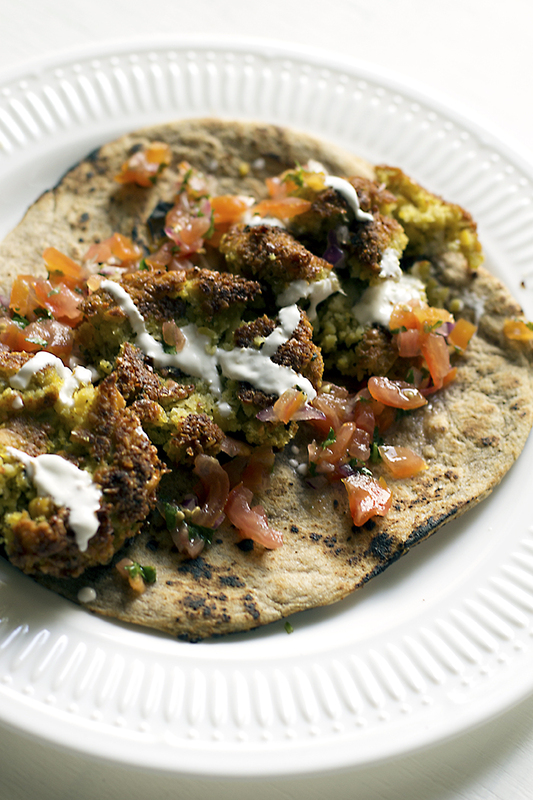 These recipes take falafels to the next level .. err.. country. 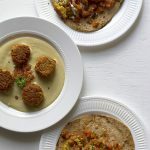 See how the traditional falafel flavors come together with a touch of Mexico and Thailand with these three variations. Soak dry garbanzo beans overnight (at least 10 hours) in a large bowl with water. The water should cover the garbanzo beans completely. The next day, measure out your ingredients above. Add garbanzo beans to a food processor or blender along with the ingredients and pulse until beans are in tiny pieces. Don’t blend too much. If you plan on making the three flavors (traditional, Mexican, and Thai), split up the mixture evenly into three bowls. See recipe notes for additional spices to add for each one. If you’re only interested in making one of those flavors, then keep the mixture intact and triple the quantities below. Whether you’re making one flavor or all three, you’ll need to put the mixture(s) in the refrigerator for 1-2 hours. This will give the flavors time to infuse a bit more. It’s frying time! After 2 hours have passed, remove the mixture(s) from the fridge. Form 1-2 inch balls out of the mixture(s). You’ll notice that they’re sticking together loosely. That’s okay. Once you fry them, you’ll notice that they stay together nicely. Speaking of, heat about 1-2 inches of avocado oil in a frying pan or skillet. Hint: after about 2-3 minutes on medium heat, the oil should be ready. Just make sure it’s not smoking. If it does, then you overheated it and you’ll want to remove it from the burner for a minute or two before starting the cooking process. Carefully add one ball to test. Cook for about 2 minutes on each side. Keep an eye on it. You don’t want it to cook quicker – you’ll risk burning the outside without a fluffy inside. Once you get that test one down, you’re ready to cover the skillet with your little creations. Leave about 1-1.5 inches of space in between each one. Using small tongs, you’ll be able to flip them easily and carefully (see recipe notes for suggestions). Enjoy by themselves, with hummus, in a pita, or however you want! Recipe above makes about 30 falafel balls. Combine the above in a bowl and let sit for 30 minutes for maximum flavor. Add more sea salt if desired.